The copperhead is a venomous pit viper native to the U.S. Distributed throughout the eastern and central parts of the country, five subspecies of copperhead can be found: the northern, southern, Osage, broad-banded and trans-pecos varieties. The snakes are all equally dangerous and similar in appearance, with just a few physical and geographical variations. All copperhead subspecies grow to between 2 and 3 feet in length and have a gray-brown to pinkish body coloration with darker crossbands. The northern copperhead's markings are darker than those of the southern variety. The broad-banded copperhead has the same coloration but thicker crossbands than the northern. Both the trans-pecos and Osage copperheads have thin white lines between the markings. All of the subspecies have the recognizable copper-colored head. In copperheads, females and males are identical and do not vary in size. Copperheads can be found in a variety of terrestrial and wetland habitats and are adaptable. The northern copperhead lives along the East Coast, with the exception of Florida, and as far west as Iowa and Missouri. The southern copperhead can be found along the Southern states from Florida to Texas and as far north as Illinois. The Osage lives in the central states, such as Oklahoma, Nebraska and Kansas. The trans-pecos is only found in the state of Texas. The broad-banded is native to Texas, Oklahoma and Kansas. Copperheads are ambush predators waiting for prey to wander by close enough and then striking and biting. The copperhead tends to let the animals then run off to die, rather than hold on to a struggling rodent that might bite or scratch them. The snake tracks its prey by scent and finds it dead and ready to eat. Copperheads will also use their yellow tails as a worm-like lure for amphibians, tempting them near. Small mammals, reptiles and amphibians are common prey items. 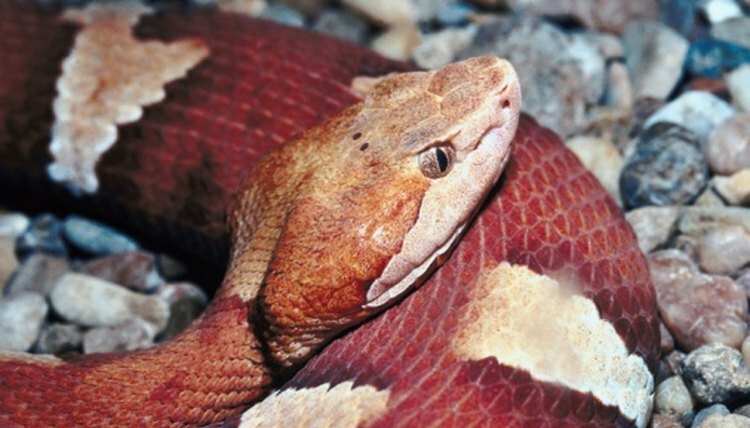 The copperheads venom is hemolytic and causes heavy bleeding. The mating season generally starts soon after the snakes wake from hibernation, with the males seeking out females by using their tongues to detect pheromones. After mating, the female incubates the eggs internally between three and nine months before giving birth eventually to live young. Copperhead litters consist of between two and 10 offspring, which are ready to defend themselves from birth with full fangs and potent venom. The young snakes are between 7 and 10 inches at birth and can live on average to be 18 years old in the wild.